We are a renowned Tour Operator from Chandigarh, Punjab. 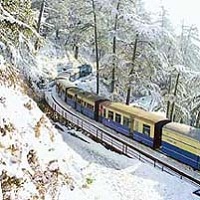 We offer the travelers, our services for Railway Ticketing to various destinations in India. Usually, the waiting list for train tickets is very long. It is not always possible to keep a check on whether your tickets have been confirmed or not. And the tatkal booking is like running in a mad rat race. Clients can handover the Railway Ticket booking task to our team and focus on other preparations for their fun-filled holiday. We have been in this field for many years and our experience is reflected in the efficiency of our services.